The weather has been super warm and it’s just so nice to be able to get out of the house and relax outside. 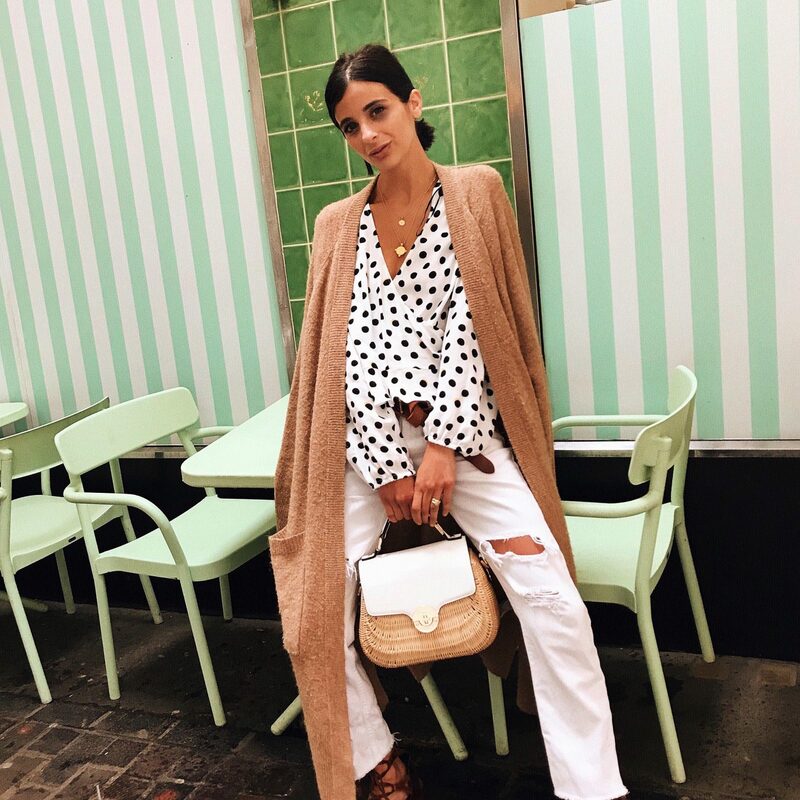 But there have been some days where the weather has been unpredictable and it all of a sudden pours down with rain and before you know it, you are wearing your favourite mules and your feet are struggling to walk and grip on with all the rain! But luckily when I was invited to the Nivea #couldyoumousse party i knew exactly how to dress and prepare myself for the change of weather. I took my sister along with me for some beauty fun with the girls at Nivea where I got to exclusively try out their new mousse product along with a few other bloggers and have a little fun and games along the way. The new Nivea mousse product is a fresh way moisturise and its weightless design makes it my new favourite beauty product to use on a daily basis to keep my skin hydrated and moisturised (not to mention smelling good!). Hopefully you caught my Instagram stories of all the fun we had in the ball pit and all the candy floss we ate! 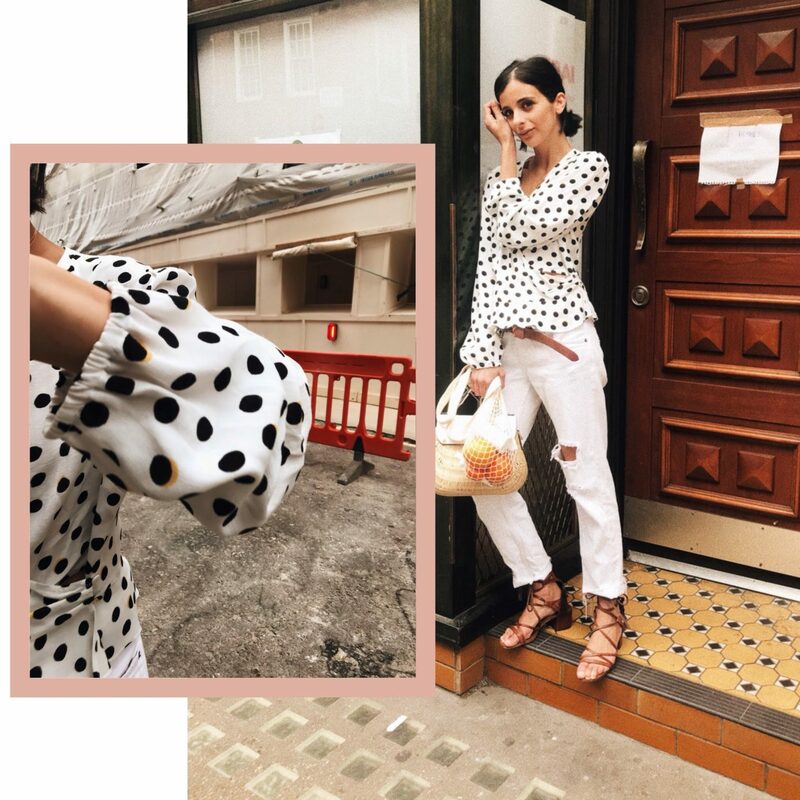 As I knew the weather was going to rain I wore my trusted Rag and Bone White denim mom jeans ( similar here and similar here) as you guys will know that white denim is my favourite kind of denim for the warmer months. 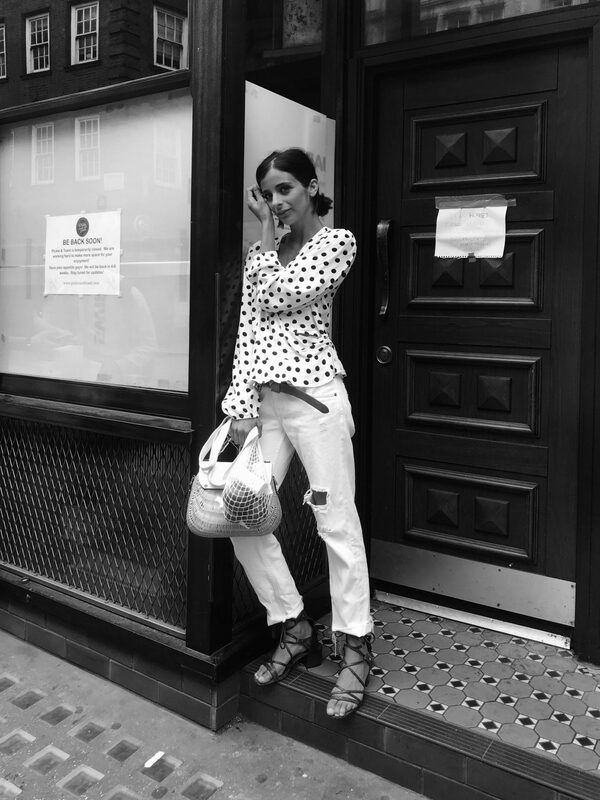 I styled my white denim pants with this season’s biggest trend, the polka dot trend. 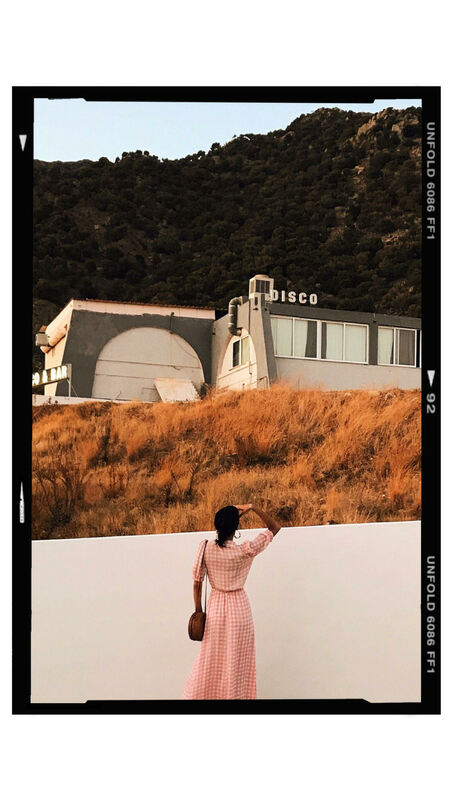 My feed has been going spot crazy and I absolutely adore this versatile print with a slight hint of the 80s vintage style that use to be huge. 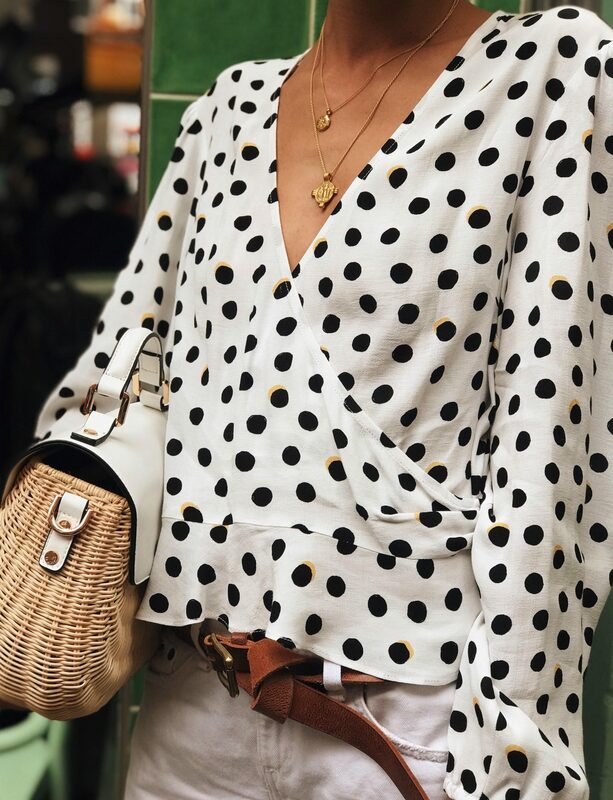 Now everywhere you shop you will find polka dots, but i’m really particular about the size of the spots and this Topshop wrap blouse (here and also available here) was the perfect monochrome sized dots ( not too big and not too small) to keep a casual look smart but effortless. 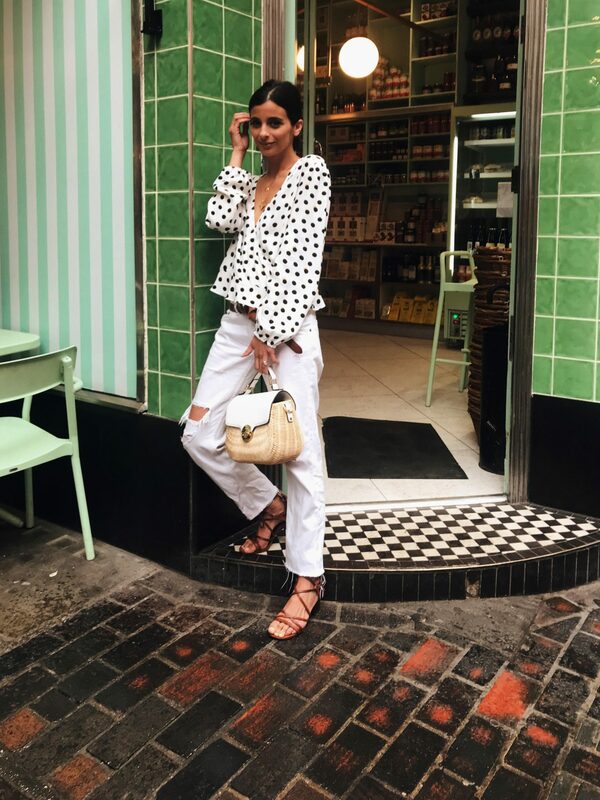 Even though I knew it was going to rain, I wore my trusted and very much over worn sandals from Zara to keep the look summery and added my favourite bag of the season that the Dune girls kindly gifted me (here) to keep the look even more like summer. I’m super excited to announce on Monday 28th my new campaign with Nivea that I’ve been super lucky to be a part of and some more exciting news to come next Wednesday! Hope you guys like it and can’t wait to show you the end result!